In your fight against the darkness in Arkham Horror Third Edition, you’ll need all the help you can get. Ancient Ones invade the edges of our reality, and chances of survival are slim at best. The smallest advantage can mean the difference between victory and an all-too terrifying defeat in the city of Arkham. You'll need the proper tools for the job if you have any hope of completing your journey with your sanity intact. This 3' x 3' slip-resistant gamemat immerses you in the twisted world of eldritch abominations, providing a full space to lay out the sprawling labyrinth that is the city of Arkham. Not only that, but the mat is the perfect way to organize your game, with room for the full board in the center and the various components along the edges. Arkham Horror Third Edition is a sprawling game, and being able to lay it out on a beautiful, high-quality mat not only enhances the aesthetic of the game, but can protect your components from unfortunate accidents at the gaming table. When dealing with ancient ones, every resource is precious, and every tool is a valuable light in the dark. 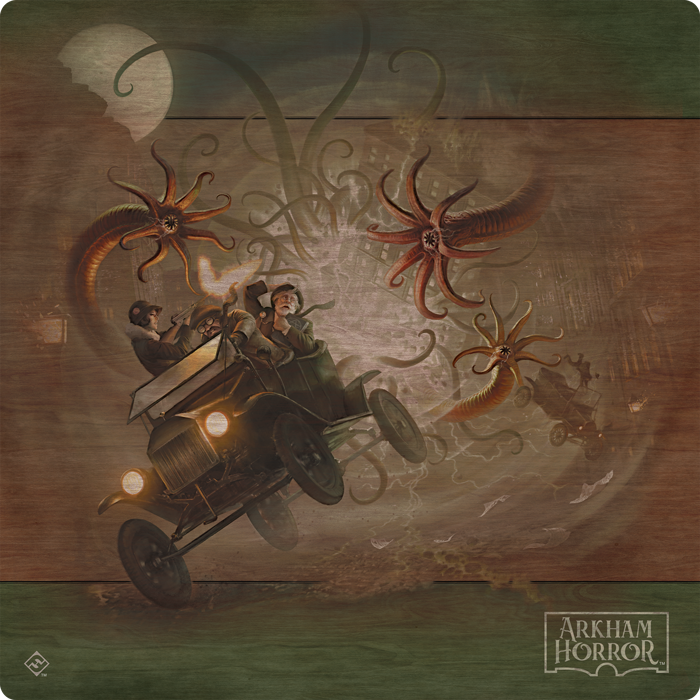 Make sure your investigators have the tools they need to succeed with the Arkham Horror Third Edition Gamemat.